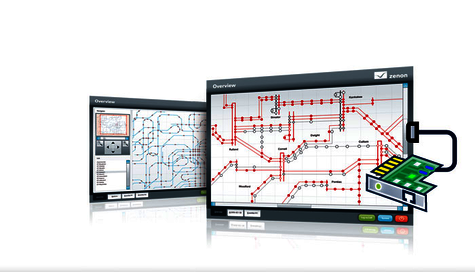 A HMI/SCADA system is only as good as the drivers and interfaces with which it is equipped. zenon Energy Edition can handle all types of protocols, e.g. IEC 61850 and DNP3, and thus makes communication possible with the most varied systems. Even devices that only work with an industry protocol and not with an energy-specific protocol can be connected without any problems. zenon provides not only IEC or DNP protocols, but also communicates via Profibus DP, Modbus, Profibus FMS and any proprietary driver of choice. This variety makes zenon particularly applicable for many municipal operations or public services. Instead of many different systems for the control and monitoring of energy, water, traffic equipment, telecommunications and cable TV, you can use one single system: zenon Energy Edition. zenon Energy Edition generally comes with all the drivers that will be required. However should a special protocol be missing, our specialists can quickly provide a suitable driver, which will of course be a high performance driver of optimum quality. Each connection is developed in-house by our specialists. They ensure that the standards are complied with perfectly and that they are developed continuously, regardless of whether it is IEC 61850 or IEC 60870 Standard, the DNP3 Standard or a special driver. The communication protocols like IEC 61850, which now number over 300, cover virtually all connection requirements in the fields of industrial and energy – a single solution covering both areas of specialization. For simple driver implementation, we recommend the straton soft SPS that is already integrated into zenon Energy Edition. This enables direct access to serial interfaces or network interfaces. With zenon Energy Edition you can connect to the most varied machines and devices simply and directly. Data is transferred reliably into the process control system and is available there for further processing, both as online data and as historical data.